The current main road, known as the B197, which runs past Ayot Green, follows a similar path to the old Great North Road from London to York. 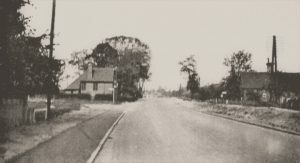 The Great North Road around 1927, looking north and showing the left hand turning to Ayot Green. 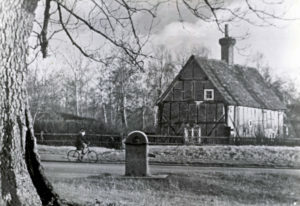 The building on the left is the village hall or reading room. The building on the right is the old toll house. The Red Lion pub is just visible in the far distance. The photographer was standing in what is now Brickwall Close to take this picture. 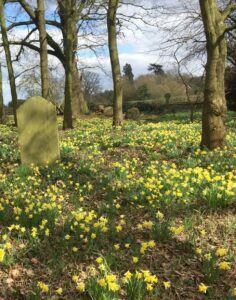 The Great North Road ran from Hatfield, through Lemsford and then past Ayot Green and into Welwyn village. 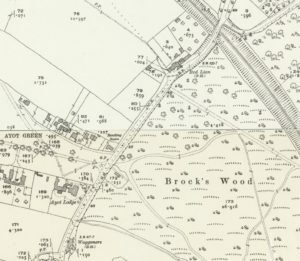 Around Ayot Green, the route ran north alongside the wall of Brocket Park and into what is now the small cul-de-sac called “Brickwall Close”, so the Waggoners public house was on the Great North Road. 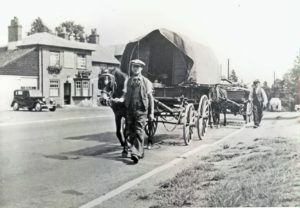 The Great North Road then continued north in a fairly straight line to the Red Lion public house, which still stands on the main road today. However, the pub is now further back from the road, and the parking area to the front of the pub was once part of the Great North Road. In the early 1970s a dramatic change took place when the A1(M) motorway was built. This changed the route of the Great North Road around Ayot Green. The construction of the A1(M) changed the whole section of road between the Waggoners and the Red Lion. It also changed the parish boundary, which had previously run down the centre of the Great North Road. This meant that the Waggoners (on the east side of the old road) was not in Ayot St Peter parish, but the Red Lion was within the parish, as it was on the west side. Boundary changes since the construction of the motorway mean that the Waggoners is now within Ayot St Peter but the Red Lion is in Welwyn. 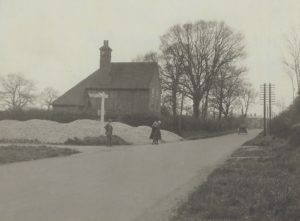 When the A1(M) was constructed two buildings that had once been part of Ayot parish were demolished. 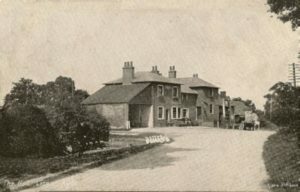 The first was the old village hall (or “reading room”) which was next to the end house on the north side of Ayot Green, on what was then the intersection of Ayot Green and the Great North Road. 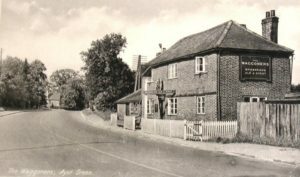 The other property that had to be demolished was 13 Digswell Hill, a cottage that had become known as “Jeeves Cottage” which fronted onto the Great North Road, and stood between the junction with Ayot Green and the Red Lion public house. It was very close to the Red Lion, as can be seen from the map above. 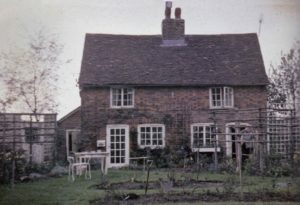 Jeeves Cottage had been occupied by several generations of the Jeeves family. At some point, probably during the 1950s, Mrs Rosalind Trench-Watson moved in to live with the widowed Mrs Minnie Gray Matilda Jeeves. Mrs Trench-Watson was the daughter of the Gray Hill family, who had at one time owned Sherrards. Mrs Jeeves had worked for the Gray Hills as a cook. After Mrs Jeeves died in 1968, Mrs Trench-Watson lived there alone until the house was demolished. 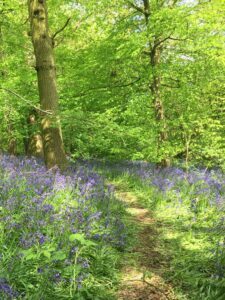 Read more …..
A third property that disappeared was the Old Toll House, known as “the house in the woods”, which was not in Ayot St Peter as it stood on the opposite side of the Great North Road. 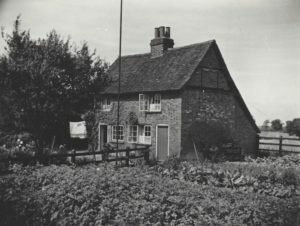 In early 1972, when the A1(M) was about to be built, the cottage was bought for £250 by a member of the Lockleys (later Welwyn) Archaeological Society, and carefully demolished by him and his friends. He originally intended to re-erect it outside Hitchin, but it is believed that it was eventually rebuilt somewhere in Norfolk or Suffolk. 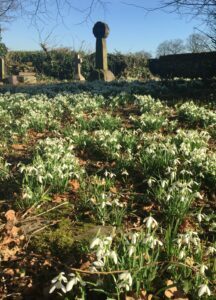 If anyone knows the final resting place of this property do please get in touch. 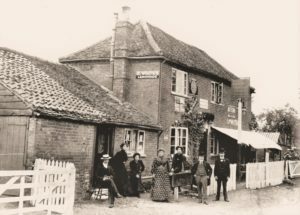 A more recent image of the Waggoners public house in the days when it stood on the Great North Road. The reading room can just be seen in the background.